Sometimes, we pick a show from the 70s, with a giant 15 person cast, and run a three day long power ranking. Sometimes, we take a show that ended seven years ago with four main cast members and it’s a little shorter. 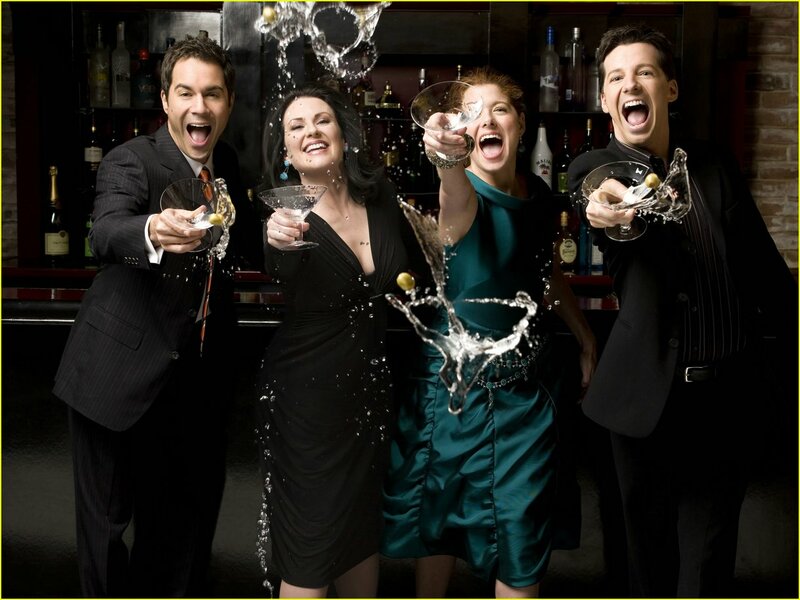 It’s the latter today, where we work with the cast of Will & Grace, but they’ve made it easier for us but all staying pretty damn busy in the seven years since their show ended in 2006. I never cared for Will & Grace as a show, but I suppose it played an important role in handing the first leading role on broadcast TV to a gay character, so absolute kudos for that. Either way, it’s certainly earned its own Power Rankings. 4. Sean Hayes (as Jack McFarland) – Hayes played Kenneth’s cousin in an episode of 30 Rock, and was in two episodes of Oxygen sitcom Campus Ladies (which apparently featured Jonah Hill). He was in The Bucket List and Soul Men. He was in an episode of Hot in Cleveland, and episode of Portlandia, and played a Indiana journalist who despises Pawnee in an episode Parks and Recreation. He played Larry in the Farrelly brothers version of the Three Stooges. Hayes was nominated for a Tony Award for his role in Broadway musical Promises, Promises, and voiced Mr. Tinkles in Cats & Dogs: The Revenge of Kitty Galore (I wish I had made up that title). He was in four episodes of Up All Night and three of Smash. He’ll be voicing a character in the upcoming Monsters Inc. sequel, Monsters University. He’s done quite a bit to get saddled with last, but he’s the clear choice for last here, which says more about the competition than it does about him. 3. Eric McCormack (as Will Truman) – McCormack did some theater immediately after the end of Will and Grace, appearing in off-Broadway Neil LaBute play Some Girl(s), and producing (though his production company Big Cattle Productions) a sitcom for Lifetime called Lovespring International, about employees at a California dating agency, which failed quickly (and starred Jane Lynch). He starred in A&E’s Michael Crichton miniseries adaptation of The Andromeda Strain. He appeared in the 100th episode of Monk and one of Law & Order: Special Victims Unit. He co-starred with Tom Cavanagh in TNT’s Trust Me, as a Creative Director of an advertising firm, and the show was cancelled after one season. He was in sci-fi film Alien Trespass and six episodes of the fifth season of The New Adventures of Old Christine (it is absolutely mind boggling that there are five seasons of that show). He has been lending his voice since 2010 to kids’ cartoon Pound Puppies and starred in a lifetime TV movie based on infamous impostor and kidnapper Clark Rockefeller, the creatively titled Who is Clark Rockefeller? As of last summer, McCormack is starring in TNT’s Perception, as a brilliant but vaguely crazy scientist who helps the FBI solve difficult cases (sounds more like a USA show, but I guess the networks aren’t that different). Perception’s second season will air this summer. The three non-Sean Hayes actors are so close that there could essentially be a three-way tie for first. McCormack gets third because while he is the main character in Perception, no one cares about or watches Perception. 2. Debra Messing (as Grace Adler) – Messing’s been very busy since Will & Grace. (not relevant for these purposes, but immediately before landing Will & Grace, she was in a failed sci-fi series called Prey; I think I am one of maybe half a dozen people to have seen it). In the year after Will & Grace ended, she was in Ed Burns indie Purple Violets and Curtis Hanson-directed Lucky You. The next year she was in the film The Women, and in highly successful USA network miniseries The Starter Wife, where she played a woman whose high-powered Hollywood husband recently left her for a younger woman. Popular enough to be turned into a regular series, The Starter Wife then lasted for one season before being cancelled. She appeared in a failed tv pilot Wright vs. Wrong (she was Wright) and got another main cast role in NBC’s much ballyhooed and made fun of Smash as lyricist Julia Houston. Her role in Smash is not as important as McCormack’s in Perception, but Smash, unlike Perception, had a public moment, mostly a bad moment, but still, a moment. 1. Megan Mullally (as Karen Walker) – She was in episodes of How I Met Your Mother, Boston Legal, The New Adventures of Old Christine, and voiced Honex Tour Guide in Bee Movie. She appeared in the main cast of short-lived ABC Chelsea Handler sitcom In the Motherhood, and in the remake of Fame. In 2010, she replaced Jane Lynch in the second season of Party Down, playing Lydia Dunfree, a mom with an aspiring actress/singer pre-teen daughter. She was in indie film Smashed in 2012 and co-starred in the ill-advised second season of Christian Slater high tech security firm sitcom Breaking In, which was cancelled soon afterwards. She’s been in all four seasons of Adult Swim show Childrens Hospital, as Chief, the crippled leader of the hospital. She was in three episodes of 30 Rock as a representative of an adoption agency, and has been in six episodes of Parks and Recreation as Ron’s second ex-wife, the crazy librarian Tammy (Mullally is Offerman’s wife in real life). She’s voiced Linda’s crazy sister Gayle in six episodes of Bob’s Burgers and Rose Stevens in one season of IFC cartoon Out There. She’s also played Penny’s song-and-dance hyper mom Dana in Happy Endings. The tie-breaker here is really that Mullally has been in more projects that I like, including Party Down, and Childrens Hospital, both of which are more acclaimed than anything Messing or McCormack have been in recently, as well as playing Tammy 2 in Parks & Recreation, which would win the tiebreaker all by itself. Known to push the button on prime time with its laierbl subject matter, Will & Grace has found a loyal fan base as part of NBC’s Thursday Must-See-TV line-up for six years. Beginning in the autumn of 2000, this season is full of laughs and such guest stars as Woody Harrelson, Gregory Hines, Patrick Dempsey, Ellen DeGeneres, Cher, Sandra Bernhard, and Molly Shannon. This season also introduces the lovable couple Joe & Larry (played by Jerry Lavine and Tim Bagley, respectively). The DVD release of Will & Grace Season 3 contains all of the season’s episodes: New Will City Fear and Clothing Husbands and Trophy Wives Girl Trouble Grace 0, Jack 2000 Love Plus One Gypsies, Tramps and Weed Lows in the Mid-Eighties Three’s a Crowd, Six is a Freak Show Coffee & Commitment Swimming Pools Movie Stars Crazy in Love Brothers, A Love Story My Uncle the Car Cheaters Mad Dogs and Average Men Poker? I Don’t Even Like Her An Old-Fashioned Piano Party The Young and the Tactless Alice Doesn’t Lisp Here Anymore Last of the Really Odd Lovers Sons & Lovers Thankfully the season 3 DVD set doesn’t contain all of the flaws that the season 2 set has. Aside from a lack of special features, the real bummer about this set is the version of the episode Cheaters that is included. Cheaters initially aired as a super-size episode, then extra footage was added for syndication, making it 2 separate 30-minute episodes. The version included in this set is the original, without the added footage. This seems particularly odd since the season 2 finale Ben? Her? was the syndicated version in the season 2 set, yet Cheaters which would have been better as the syndicated version, is NOT the syndicated version in the season 3 set??? All in all, the set is worth buying if your a fan of the series. Let’s hope that the powers that be take their time with the next release to ensure we get a flawless season 4 set.